International Development Division, Abt Associates Inc., Bethesda, MD, USA. Department of Health Policy and Management, School of Public Health, University of Zambia, Lusaka, Zambia. Department of Community Health and Behavioral Sciences, School of Public Health, College of Health Sciences, Makerere University, Kampala, Uganda. Uganda Country Office, U.S. Centers for Disease Control and Prevention, Entebbe, Uganda. U.S. Agency for International Development, Lusaka, Zambia. Bureau for Global Health, U.S. Agency for International Development, Washington, DC, USA, and RTI, Washington, DC, USA. Now with Palladium, Abuja, Nigeria. Centre for Infectious Disease Research in Zambia, Lusaka, Zambia. U.S. Agency for International Development, Kampala, Uganda. Bureau for Global Health, U.S. Agency for International Development, Washington, DC. The primary objective of this study was to estimate the costs and the incremental cost-effectiveness of maternal and newborn care associated with the Saving Mothers, Giving Life (SMGL) initiative—a comprehensive district-strengthening approach addressing the 3 delays associated with maternal mortality—in Uganda and Zambia. To assess effectiveness, we used a before-after design comparing facility outcome data from 2012 (before) and 2016 (after). To estimate costs, we used unit costs collected from comparison districts in 2016 coupled with data on health services utilization from 2012 in SMGL-supported districts to estimate the costs before the start of SMGL. We collected data from health facilities, ministerial health offices, and implementing partners for the year 2016 in 2 SMGL-supported districts in each country and in 3 comparison non-SMGL districts (2 in Zambia, 1 in Uganda). Incremental costs for maternal and newborn health care per SMGL-supported district in 2016 was estimated to be US$845,000 in Uganda and $760,000 in Zambia. The incremental cost per delivery was estimated to be $38 in Uganda and $95 in Zambia. For the districts included in this study, SMGL maternal and newborn health activities were associated with approximately 164 deaths averted in Uganda and 121 deaths averted in Zambia in 2016 compared to 2012. In Uganda, the cost per death averted was $10,311, or $177 per life-year gained. In Zambia, the cost per death averted was $12,514, or $206 per life-year gained. The SMGL approach can be very cost-effective, with the cost per life-year gained as a percentage of the gross domestic product (GDP) being 25.6% and 16.4% in Uganda and Zambia, respectively. In terms of affordability, the SMGL approach could be paid for by increasing health spending from 7.3% to 7.5% of GDP in Uganda and from 5.4% to 5.8% in Zambia. Sub-Saharan Africa has the highest lifetime risk of maternal mortality (1:36) of any region in the world.1,2 For example, the maternal mortality ratio in 2015 was 546 per 100,000 live births, with an estimated 201,000 maternal deaths. The maternal mortality ratio in sub-Saharan Africa is almost 22 times that in Europe.1,2 Studies have documented the financial, economic, and social consequences of maternal deaths, including increased risk of death for newborns and lower educational achievement, poorer economic outcomes, and poorer health for surviving children.3,4 Coverage of essential antenatal, maternal, and newborn health services remains below levels needed to reach internationally agreed upon goals.5 Despite these continuing challenges, the maternal mortality ratio declined in sub-Saharan Africa between 1990 and 2015 by 45%,6 coinciding with the scale-up of essential antenatal, maternal, and newborn interventions. Three health system barriers have long been known to delay timely access to quality obstetric and newborn care—the 3 delays pertain to seeking care at a health facility, reaching a facility in time, and receiving quality care once there. Other studies demonstrate the effectiveness of interventions to reduce one or more of the 3 delays,12–14 but the literature on the cost of these interventions is limited. A recent review of the costs of maternal care in low- and middle-income countries found 8 studies assessing the costs of antenatal care and 18 studies assessing the costs of delivery.15 Of these, only 1 study from sub-Saharan Africa included the costs of community-based maternal support.15 Further, existing literature on the cost-effectiveness of maternal health interventions tends to focus on the additional costs and effectiveness of a single intervention16–20 that typically addresses only 1 of the 3 delays. A few cost-effectiveness studies include health systems strengthening as a complement to a demand generation intervention21 or assess the cost-effectiveness of a more comprehensive approach to improving coverage of skilled care at birth.22 Overall, however, the literature assessing the costs and cost-effectiveness of a comprehensive health systems strengthening approach to address all 3 delays is scarce. An exception is a cost-effectiveness analysis of maternal and newborn interventions in Uganda under Phase 1 of the Saving Mothers, Giving Life (SMGL) initiative,23 but this study did not account for the full costs of interventions, chiefly because indirect facility overheads were not considered. The primary objectives of the current study were to estimate the costs and incremental cost-effectiveness of maternal and newborn care associated with SMGL's comprehensive district- strengthening approach to addressing the 3 delays in selected districts in Uganda and Zambia. Secondarily, we assessed the sources of financing for the SMGL interventions. Findings from our analyses can inform stakeholder investments on cost-effective means to reduce maternal and perinatal mortality. Understanding the maternal health ecosystem in a given geographic area through formal assessment of both public and private sectors. Using scarce resources rationally to address gaps and improve access to and quality of care. Decreasing missed opportunities by integrating MNH and HIV services. The SMGL approach is based on context-specific solutions to maternal and newborn health problems. In the first year of implementation, SMGL was associated with a 35% reduction in the institutional maternal mortality ratio across the 2 countries.7 Donor investment was planned to be largest in the first years of the SMGL initiative, with national and local governments assuming greater responsibility for SMGL costs over time. Table 1 lists the interventions and activities included in the costing estimates for Uganda and Zambia. The estimated costs of MNH interventions were assessed in a subset of the districts where the SMGL approach was implemented and compared to estimated costs in 2012, prior to SMGL interventions. Since costs were not directly collected in the SMGL-supported districts prior to SMGL implementation in 2012, we derived comparison costs from the 2016 unit costs (e.g., cost per antenatal care visit, cost per vaginal delivery, cost per cesarean delivery) in neighboring districts where MNH programs were chiefly supported by country government efforts alone, to be consistent with the time frame for the effectiveness evaluation (end year as 2016). Table 2 lists the variables used in the cost-effectiveness analysis, along with the sources of data. The estimated costs of MNH interventions were assessed in selected districts where the SMGL approach was implemented and compared to estimated costs in 2012, prior to SMGL interventions. Because cost data prior to SMGL implementation were not available, we assumed that SMGL would affect the unit cost of health services through both the scale (quantity utilized) and quality of services.32 Thus, we selected comparison districts in the costing analysis for proxy measures of costs before SMGL, assuming that the unit prices of health services in these districts were similar to those in the SMGL-supported districts prior to interventions. We also assumed that unit costs in the comparison districts did not change substantially during the 2012–2016 time period, and we conducted sensitivity analyses to explore this assumption. We used districts as the unit of analysis because the SMGL approach was implemented at the district level, and many of the costs were incurred at the district level and could not be easily attributed to specific health facilities. This study assessed costs associated with provision of MNH care retrospectively in the SMGL intervention districts for the year 2016, including annualized start-up costs and capital costs over the 2012–2016 period. Start-up costs are defined as the costs for activities needed to establish interventions that are not incurred on an annual basis, while capital costs include the purchase of durable goods that are used over multiple years. Thus, we assumed effects are not cumulative across years except to the extent that continued capacity building, which is captured in start-up costs, allowed for increasing the effectiveness of the SMGL approach over time. We also assessed unit costs in comparison districts for the year 2016. We then used these unit costs together with 2012 utilization data from SMGL intervention districts to estimate costs in 2012 in the SMGL-supported districts (before SMGL started). Planned data collection included 2 of the 4 learning districts in each country. In Zambia, we randomly selected Mansa and Nyimba from the 4 SMGL-supported districts for inclusion in these analyses. Mansa became 2 separate districts (Mansa and Chembe) in 2012, and data were collected from both. We also selected 2 districts, Kapiri Mposhi and Mbala, for comparative purposes for the costing analyses. The intent was to conduct the costing study in districts used in an external evaluation of SMGL at the end of Phase 1, where 2 comparison districts were selected to be similar to SMGL-supported districts across a number of factors (including health infrastructure, geography and climate, health utilization, morbidity and mortality, and socioeconomic context) that would also likely influence costs.29 However, one of the comparison districts (Kabwe) later received extensive donor support for MNH programs and was excluded. We decided to select a second comparison district from the Northern Province. We randomly selected Mbala district after excluding districts participating in the World Bank's results-based financing project in the province. In Uganda, we purposively included the greater Kibaale district (now existing as 3 districts; data were collected from all 3 districts) in the study because it was the only SMGL district to receive extensive support from one of the 2 main implementing partners. From the other 3 SMGL-supported districts, we selected Kyenjojo as the remaining rural district with a district hospital. Both districts received similar SMGL-supported interventions, with the exception of transport vouchers, which were implemented in Kyenjojo only.33 We also included the Fort Portal Referral Hospital, which received referrals from both Kibaale and Kyenjojo (and is located in a third SMGL district). For comparison purposes, we selected Masindi district, which served as a comparison district in an early evaluation of SMGL because it is located in the Western region and has a population and health system similar to the SMGL-supported districts. Due to limited time and budget, only one comparison district was included in Uganda. In each of the selected districts of Uganda and Zambia, we collected data from the district health office, the government hospital in that district, and 2 randomly selected government health centers. Overall, we collected data from 5 districts, 4 hospitals, and 6 health centers in Uganda (3 health centers level III and 3 health centers level IV—one of each type in each of 2 SMGL-supported districts and in the comparison district), and 5 districts, 4 hospitals, and 8 health centers in Zambia. Data relating to MNH care activities in these districts were collected from district and provincial health offices (where appropriate) at the national level and from implementing partners, including 3 implementing partners in Uganda and over 30 in Zambia involved in MNH care, in the districts included in this analysis. Overall, we collected data from 5 districts, 4 hospitals, and 6 health centers in Uganda, and 5 districts, 4 hospitals, and 8 health centers in Zambia. The data collection specific to this study was exempted from the need for ethical approval by Abt Associates Institutional Review Board and from the University of Zambia Biomedical Research Ethics Committee in July 2017 because it did not include research on human subjects. The study received approval from the Makerere University of Public Health Higher Degrees, Research, and Ethics Committee in January 2018 and the Uganda National Council for Science and Technology (approval number SS 4511) in February 2018. Data collection at health facilities occurred in July–August 2017 in Zambia and February–March 2018 in Uganda. Trained data collection teams extracted information on health facility area (square meters), staffing, service utilization, vehicles, and consumption of commodities from these facilities. Data were entered into Microsoft Excel templates designed for the study and were reviewed daily by data collection supervisors and again by the research team. Questions were sent to data collectors to verify information, and facilities were contacted again to clarify ambiguous information as needed. Similarly, structured templates were used to capture data at district health offices and, where appropriate, provincial health offices related to overall district health statistics (e.g., number of deliveries, number of health facilities) and activities related to MNH (e.g., training, health systems strengthening, mentoring, supervision, community outreach) during 2012–2016 for annualized start-up costs. Data collection templates were constructed based on past analyses of expenditures in SMGL areas34,35 and sent to implementing partners. Data collectors then visited these partners to provide support for extracting the necessary data. Implementing partners provided data on all relevant start-up activity costs, capital expenditures, and routine activities for 2012–2016. Costs for national-level activities were not included unless the activity specifically focused on one of the districts included in these analyses; thus, for example, these analyses did not include costs for international staff and national staff working on multiple projects in addition to SMGL or costs for offices outside the SMGL districts. Data were collected for all activities supporting MNH, whether or not they were “officially” part of SMGL. However, some activities were not assessed as part of the SMGL evaluation, including HIV/AIDS care or prevention for pregnant women and postpartum family planning outside the MNH clinics of health facilities, unless the SMGL program specifically included them. Data were collected for all activities supporting MNH, whether or not they were “officially” part of SMGL. We used a financial approach to estimate the costs of activities presented in Table 1. Costs of activities targeting communities included the support of volunteer community groups (Village Health Teams in Uganda and Safe Motherhood Action Groups in Zambia), including costs to train, equip, and organize group meetings. We employed a mix of top-down and bottom-up costing methods to estimate health facility costs.40 Costs of administrative and support services (e.g., cleaning, maintenance) were allocated to maternal, newborn, and antenatal wards or clinics based on number of staff, size, number of prescriptions, or service utilization in a top-down manner. Costs for ambulances were allocated to MNH services based on a review of ambulance logs. Whenever possible, quantities of consumables used directly in provision of maternal and newborn care were estimated from existing registers and stock cards specifying the amounts issued to a ward or clinic. If these data were not available, we relied on either allocation based on utilization (for general drugs and supplies) or health facility staff opinion (for drugs used specifically for maternal health). Quantities of consumables were multiplied by their unit prices, which were collected at the national level. Staff costs, inclusive of salary and benefits, were allocated to MNH services based on assigned duty stations, opening hours, work patterns, and service utilization. In Uganda, costs for utilities and building costs in public facilities were estimated based on implementing partners' accounts of costs for similar items; in Zambia, costs for utilities and buildings were estimated from previous costing exercises (R Homan, FHI 360, written communication, January 2018). Almost 40% of delivering facilities in Uganda SMGL-supported districts and 9% in Zambia are private.30 Costs for maternal and newborn services at nongovernmental health facilities in Uganda were based on a previous study carried out in the same districts.41 Costs incurred at health facilities and reported by implementing partners were cross-checked to ensure that items were not double counted. Total costs for MNH services for entire districts were estimated using the average unit costs from sampled facilities for different types of services (e.g., antenatal care, vaginal delivery, cesarean delivery) and multiplying the results by the total utilization of these services in a district. These figures include costs for inpatient admissions. For estimates of costs before the start of SMGL, we used utilization numbers from the SMGL-supported districts in 2012 and unit costs from comparison districts, while for 2016 we used utilization numbers and unit costs from SMGL-supported districts in 2016. We disaggregated these calculations by type of health facility. We then added costs incurred at the community level and “above service delivery costs” (e.g., costs for offices located in districts, general and office support staff, program vehicles, and other general management and planning activities) to the facility-based costs. For SMGL districts, the programmatic costs and facility costs to address the first, second, and third delay total costs were added to derive the total costs for the districts. To convert costs incurred outside health facilities in comparison districts to costs incurred in 2012, we divided these costs by the number of facility deliveries in the comparison districts and then multiplied the results by the number of facility deliveries estimated to have occurred without SMGL in the SMGL districts. This calculation assumes that costs outside facilities varied directly with the number of deliveries at facilities; however, costs outside facilities in the comparison districts were a small proportion of all costs. For the 2012 cost estimates, we included observed community-level and above service delivery level costs from the comparison districts, under the assumption that these activities also likely existed in SMGL-supported districts before the start of SMGL. We calculated costs per facility delivery in 2012 (i.e., baseline facility delivery costs) and in 2016 (defined as the costs of improved facility delivery, which included all costs associated with delivery, demand generation, and transport). Incremental costs were calculated by taking the difference between the estimated total costs in 2016 and those in 2012. Sources of financing (donor, government, and private) were tracked throughout this exercise. To estimate the health impact, we used the facility-based maternal mortality ratios and perinatal death rates in 2016 in SMGL-supported districts multiplied by the reported number of facility-based deliveries for the cohort of women giving birth in 2016 to determine the number of deaths in 2016.31 To estimate the number of deaths that would have occurred in the same districts in the absence of SMGL, we started with the number of deliveries for SMGL districts in 2016 multiplied by the institutional delivery rate in 2012 to estimate the number of facility-based deliveries that would have occurred without SMGL. To account for secular trends in maternal mortality and perinatal deaths, we adjusted the facility-based maternal mortality ratios and perinatal death rates from 2012 by subtracting the change in these indicators at a national level from 2012 to 2016 from the SMGL district-specific 2012 figures (see Supplement 1).27,28,42,43 To reflect a generalizable cost-effectiveness applicable as broadly as possible, we used the facility-based death ratios/rates from all SMGL areas. However, since we collected costs in only half of the SMGL-supported districts, this approach assumes that costs in the districts included in the costing data collection did not differ substantially from those in the SMGL-supported districts where cost data were not collected. We subsequently explored this assumption in a sensitivity analysis (described below). We used locally published discount rates to calculate annual equivalent costs. We re-estimated the increased number of deliveries at health facilities using data from all 4 SMGL-supported districts rather than the 2 districts included in the costing. Chance variation in the increase in the number of deliveries at health facilities between districts may change the results. We re-estimated the proportion of facility deliveries by cesarean delivery, for the same reason as above and using the same method. We re-estimated incremental costs by considering all donor-supported costs as incremental costs (as opposed to using estimated 2012 costs). Although donor funds may displace some other sources of funding, this provides an upper-end estimation of the incremental costs in the absence of other district data. We conducted sensitivity analyses to explore the potential impact of our assumptions on the results. Applying each of these 5 scenarios, we also calculated a “combined-case” scenario in which all the above scenarios were included at the least favorable value. Finally, we re-ran the analyses using mortality rates/ratios specific to the 2 SMGL-supported districts included in the costing. Average unit costs of a vaginal delivery in facilities in SMGL districts were lower or comparable to costs in facilities in non-SMGL districts in Uganda in 2016 (Table 3). The opposite is true for Zambia, where average unit costs were generally higher in facilities in SMGL districts. Specifically, in Uganda facility-based cost (excluding training of staff) for a vaginal delivery ranged from $24 to $45 across types of facilities in districts where SMGL was implemented, compared to $25 to $57 across types of facilities in the comparison district. In Zambia, the cost of a vaginal delivery was $42 at health centers and $118 at hospitals (on average across types of hospitals) in districts where SMGL was implemented, compared to $18 and $56, respectively, in comparison districts. Similarly, cesarean delivery unit costs in Uganda were lower in health centers ($202) in SMGL districts than in health centers in the comparison district ($337). However, the costs were higher in Uganda hospitals ($163) in SMGL districts than in hospitals ($140) in the comparison district. At the referral hospital in an SMGL district, the cost of a cesarean delivery was $79 because the operating theater had a relatively high volume of services. In Zambia, the average cesarean delivery unit costs were lower in hospitals ($468 on average across types of hospitals) in SMGL districts compared to hospitals ($508) in comparison districts. Average unit costs of an antenatal care visit were lower in health centers ($3.66 for level III and $3.59 for level IV) in SMGL districts than in health centers ($5.49 for level III and $5.07 for level IV) in the comparison district in Uganda. In contrast, hospitals in SMGL districts had higher average unit costs ($5.03) compared to hospitals ($4.60) in the comparison district for an antenatal visit. The cost structure in Zambia was different; health centers in SMGL districts had higher average unit costs of an antenatal care visit ($4.50) than facilities ($3.96) in comparison districts, while there were mixed results from the comparison of SMGL hospitals and non-SMGL hospitals. Each improved facility delivery cost about $104 in Uganda and $196 in Zambia. In 2012 in Uganda, total costs for MNH care were estimated to be about $650,000 per district, or almost $66 per facility delivery, while total costs for MNH care in Zambia in 2012 were estimated to be just under $425,000 per district or about $101 per facility delivery. Total costs for MNH care per district for the year 2016 were approximately $1.5 million in SMGL-supported districts in Uganda and almost $1.2 million in Zambia (Table 4). This translates to approximately $104 per “improved facility delivery” in Uganda and $196 per improved facility delivery in Zambia. In 2016, donors covered about 49% of the MNH costs in Uganda and 45% of costs in Zambia in the SMGL-supported districts. In comparison districts, donors covered 2% (Uganda) and 3% (Zambia) of all costs in 2016. Costs incurred at private facilities accounted for 16% of costs in SMGL-supported districts in Uganda (although we were not able to assess the amount of donor financial support for births at private facilities). Donors supported the majority of costs associated with the first and second delays and just under 30% of costs related to the third delay in SMGLsupported districts. Donors supported the majority of costs associated with the first and second delays and just under 30% of costs related to the third delay in both countries in SMGL-supported districts. In Uganda, the cost per facility delivery in 2016 in the SMGL-supported index districts was $38 higher than in 2012. Over 35% of the incremental cost went to support activities addressing the first delay, about 44% was spent on issues related to the third delay, 2% was spent on issues related to the second delay, and the remainder was spent on above community/facility costs for program support. Similarly, the cost per facility delivery in Zambia in SMGL-supported districts was about $95 more in 2016 than in 2012. Addressing the first delay accounted for about 14% of the incremental cost, and above community/facility costs for program support were associated with approximately 21% of the incremental cost per facility delivery. About 52% of the incremental cost in SMGL-supported districts in Zambia addressed the third delay. Based on the number of facility deliveries in the 4 districts included in this analysis, scale-up of MNH activities is associated with averting 164 deaths in Uganda and 121 deaths in Zambia in the 2 SMGL-supported districts in 2016 included in this analysis (Table 5). This translates to 9,549 years of life gained in Uganda and 7,362 years of life gained in Zambia. In Uganda, the incremental costs were estimated to be about $1,690,859, or $10,311 per death averted and $177 per life-year gained. With an estimated incremental cost of $1,519,338 in Zambia in 2016, the incremental cost per death averted was $12,514, or $206 per life-year gained. Figure 1a and Figure 1b depict for Uganda and Zambia, respectively, the cost per death averted or the cost per life-year gained along the x-axis, with each bar representing the change in the incremental cost-effectiveness ratio associated with changing an assumption. In Uganda, including effects only from Kibaale and Kyenjojo districts would result in a cost per death averted of about $25,550, with a cost per life-year gained of about $511 (Figure 1a). 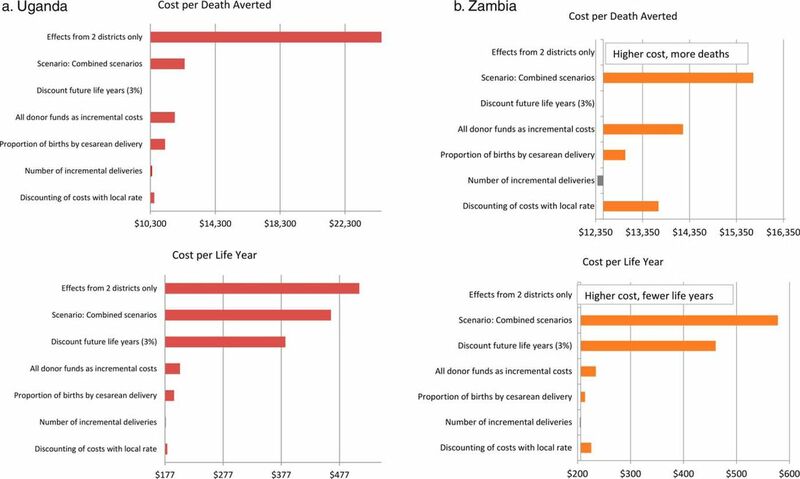 In Zambia, while the overall SMGL program was associated with reductions in mortality, using data from only Mansa and Nyimba resulted in a higher cost and reverse mortality effect (Figure 1b). This outcome was due to higher facility-based maternal and perinatal death rates in Mansa district in 2016 than in 2012, which were greater than the lower deaths rates in Nyimba district. The mortality increase in Mansa was largely due to more adverse outcomes that occurred in the referral hospital in Mansa in 2016, which provided delivery care to SMGL districts and to 5 additional non-SMGL-supported districts as well. In Uganda and Zambia, results related to the cost per death averted were otherwise most sensitive to assumptions about using all donor costs as incremental costs. For any given scenario, the cost per death averted remained less than $12,000 in Uganda and $14,300 in Zambia. In a scenario combining the 5 main sensitivity analyses, where all assumptions were moved to the least favorable cost-effectiveness scenario, the cost per death averted was around $12,411 in Uganda and $15,708 in Zambia. The cost per life-year saved was most sensitive to the assumption about whether to discount future life-years. When future life-years were discounted, the cost per life-year gained increased to $384 in Uganda and $460 in Zambia. In the scenario combining the 5 main sensitivity analyses, the cost per life-year gained was $462 in Uganda and $578 in Zambia. In the 4 SMGL-supported districts included in these analyses, scale-up of MNH interventions prevented an estimated 285 institutional maternal and perinatal deaths in 2016, or about 71 death per district per year (0.6 death averted per 100 facility deliveries in Uganda and 1.0 death averted per 100 facility deliveries in Zambia). GDP per capita is a commonly used benchmark to determine whether or not an intervention is highly cost-effective, with the cost per DALY averted below the GDP per capita used as the benchmark for being highly cost-effective.36 The assessments of SMGL did not track changes in morbidity, and, to the extent that scale-up of MNH interventions prevented or ameliorated morbidity, our use of life-years gained likely underestimated the effects (as compared to DALYs averted). In the 4 SMGL-supported districts included in these analyses, scale-up of MNH interventions prevented an estimated 285 institutional maternal and perinatal deaths in 2016. Nevertheless, we found that the incremental cost per life-year gained in Uganda was $177, or 25.6% of the GDP per capita of $692, and the incremental cost per life-year gained in Zambia was $206, which is 16.4% of the GDP per capita of $1,257. We found that the incremental cost per life-year gained was $177 in Uganda and $206 in Zambia. A previous study assessing SMGL activities in Uganda suggested an incremental cost ranging from $28 to $104 per improved delivery, depending upon which activities were included in the costs, compared with our finding of about $38 per facility delivery.23 Another study assessing a maternal voucher scheme in Uganda, however, found that it cost about $340 per DALY averted, a higher ratio than we found here.21 However, only one district in our study promoted maternal vouchers, while a second had only 24% of facility deliveries supported by vouchers in 2016.33 Another study assessing surgical interventions for maternal health found a cost per DALY averted ranging from $7 to $360, depending on the procedure.47 Overall, the cost per life-year gained estimated here tends to be higher than the cost per DALY averted found in global models, but is similar to or lower than the cost per DALY averted from assessments of specific interventions in Uganda. While recent estimates of unit costs of MNH activities are not available in Zambia, the unit costs found in this study are on the higher end of unit costs from other studies in Uganda. For example, a recent review found the cost of antenatal care in Uganda was about $5.90 at health centers and $6.40 at hospitals per woman,15 only marginally more than our estimated cost per antenatal care visit in Uganda. The same review also found that the cost per vaginal delivery in a facility in Uganda ranged from $5 to $46 across studies (compared with $24 to $45 in SMGL-supported districts and $25 to $57 in comparison districts documented here). The cost per cesarean delivery ranged from $61 to $108 (compared with $31 to $202 in SMGL-supported districts and $140 to $337 in comparison districts documented here).15 These findings suggest that the costs we estimated in our study are similar to or higher than those reported previously, at least for Uganda. We did not see a marked change across the board in unit costs of services between SMGL-supported districts and comparison districts when we included only costs incurred at health facilities. In many cases, unit costs were lower in SMGL-supported districts. This was likely because of higher patient volumes in SMGL-supported facilities, with the increased efficiency in the use of capital and overhead costs offsetting the costs of increasing the quality of services. The exception was for vaginal delivery in Zambia, where unit costs were mostly higher in SMGL-supported districts than in comparison districts, but also where there was less difference in the number of deliveries between 2012 and 2016 than in Uganda. When we included costs incurred outside health facilities, including training, mentoring, and community mobilization—that is, the cost of an improved facility delivery—the cost per facility delivery in SMGL-supported districts was substantively higher than in comparison districts. Funding for reducing the first delay constituted 36% of incremental costs in Uganda and 14% of incremental costs in Zambia, representing 20% and 10% of total costs in SMGL-supported districts, respectively. In comparison districts, the cost of activities addressing the first delay was either nonexistent (Uganda) or marginal ($1.81 per facility delivery in Zambia). Costs for the activities addressing the second delay were 4% and 9% of total costs in SMGL-supported districts in Uganda and Zambia, respectively. While funding for the second delay was similar in the SMGL-supported and comparison districts in Uganda (transportation vouchers were not implemented in Kibaale, and used only on a limited basis in 2016 in Kyenjojo), it was substantially higher in Zambia, where costs for maternity homes were a main cost driver for the second delay. For each facility delivery, $17.73 was spent on activities addressing the second delay in Zambia SMGL-supported districts, contrasting with $2.44 in comparison districts. The increase in costs per facility delivery was less marked (in percentage terms) for activities addressing the third delay, possibly representing either efficiencies, as noted above, or displacement of other funds. In terms of the total incremental costs, the third delay used the highest amount of resources in Uganda (about $370,000 per district) and in Zambia (about $394,000 per district). However, the results suggest that spending about 20% to 25% of MNH budgets to address the first 2 delays—critical delays that can prevent women from accessing care in a timely way—can be enough to improve receipt of timely facility care at birth. While securing and ensuring funding for activities to address the first 2 delays is critical, the results also suggest that in Uganda and Zambia, funding for facility deliveries was inadequate in 2012 to provide sufficient quantity and quality of care, with donors supporting more than 25% of costs addressing the third delay in SMGL districts in both Uganda and Zambia in 2016. The results suggest that spending about 20% to 25% of MNH budgets to address the first 2 delays can be enough to improve receipt of timely facility care at birth. This study is limited by use of comparison districts that were assessed only at the end of the SMGL program. These districts serve as an imperfect proxy estimate of the cost of MNH services before the start of the SMGL program. In addition, use of before and after data to estimate the effects of the scale-up of MNH services is subject to confounding due to secular trends. Although we tried to account for secular trends using national data, the national trends may not have been realized in the SMGL districts over the same time period. Because data from 2016 in comparison areas were used as proxies for unit costs in SMGL-supported districts in 2012, we assessed data from 2016 in comparison districts with data from SMGL-supported districts in 2012 to ensure comparability. In Uganda, there were about 700 births per facility in SMGL-supported districts in 2012 and 500 births per facility in comparison districts in 2016, while in Zambia, there were about 225 births per facility in both 2012 in SMGL-supported districts and 2016 in comparison districts. In Uganda, 6% of facility births were by cesarean delivery in the SMGL-supported districts in 2012, compared with 9% in comparison districts in 2016, while in Zambia the percentage of facility births by cesarean delivery was 7% and 3%, respectively. Because data from comparison districts suggest a close match with intervention districts before the start of SMGL in some cases but a notable difference in other instances, we addressed potential biases in sensitivity analyses by using available data on likely ranges for changes in facility-based deliveries, cesarean deliveries, and incremental costs per facility delivery. In all cases, conclusions did not change substantively. However, the effects presented here could potentially be underestimates for several reasons. Assessing progress in reducing facility maternal and perinatal mortality during the initiative required using facility data and data abstraction protocols. In 2012, each country faced the immediate challenge of how to produce baseline measurements of maternal and perinatal mortality in the period immediately before the initiative began and comparable measurements during the initiative, when data quality improvements were institutionalized. At baseline, each country used its existing data systems and infrastructure to devise its own independent data-collection approach. Although the definitions of indicators were standard, the quality of primary data used to calculate the number of maternal and perinatal deaths was substantially lower at baseline than at endline in both countries. In addition, differences in data collection existed between Uganda and Zambia. Thus, some deaths were likely missed in the baseline count, which would bias our results downward. Further, the proportion of deliveries in facilities increased over time, but we applied the facility-based death ratios/rates to all births. To the extent that women who would have given birth at home without SMGL would have worse outcomes than were observed for facility births, we underestimate the effects of the program. Donors spent upwards of $733,000 per district in Uganda and $538,000 per district in Zambia in total annual equivalent costs, and in the first year of SMGL $2 million and $1.5 per district in real budgetary expenditures. These findings are in keeping with a previous study assessing SMGL expenditures (the data from these studies were reviewed as part of these analyses).34,35 Recent global estimates suggest that $11 or more per capita per year in added costs are needed in sub-Saharan Africa to meet the full needs of MNH, sexual, and reproductive health care.49 While not achieving the full 80% mortality reductions suggested by the $11 per capita figure and including a different set of interventions, the incremental annual costs of the project represent about $1.36 per person living in the SMGL-supported districts in Uganda and $4.85 per person in Zambia. Thus, the SMGL project could be paid for by increasing health spending from 7.3% of GDP in 2015 (in Uganda) and 5.4% (in Zambia) to 7.5% and 5.8% of GDP, respectively.44,45 Further, SMGL used an accelerated and capital-intensive model in Uganda and Zambia. Excluding capital and start-up costs, the donor financing for recurrent costs in 2016 was about $645,000 per district in Uganda and $135,000 per district in Zambia—just over $1 per person in Uganda districts and about $0.86 per person in Zambia districts. The SMGL project utilized program implementation staff located in the SMGL-supported districts, the costs of which are included here. However, if the model is replicated, the cost structures the governments may use would possibly be different from those used by implementing partners, or some duplication of efforts may possibly be reduced. Thus, the 10% to 14% of costs represented by above service delivery and community costs could be reduced when the program is replicated. Further work assessing the future financial implications and budgetary impact of continuing SMGL (or implementing SMGL in other districts or countries) is needed. While the results from Uganda and Zambia were similar in terms of their cost-effectiveness, the sensitivity analyses looking at results only for districts with cost data indicate that heterogeneity would certainly exist in applying the results to other settings and within countries themselves. SMGL was targeted to areas within Uganda and Zambia with high maternal mortality, with some activities tailored to each district. Similar targeted approaches are likely necessary in other settings, which may affect the cost-effectiveness in any particular setting. Further, the costs presented here do not account for potential changes to costs structures, demand for services, and average unit costs over time. In the future, increased uptake of family planning, further increases in demand for and use of services, and so forth will likely change the unit costs of delivering MNH services as well as the mix of activities needed. Thus, the cost-effectiveness of district health strengthening approaches such as SMGL will likely also change over time. The SMGL project could be paid for by increasing health spending from the 7.3% of GDP in 2015 (in Uganda) and 5.4% (in Zambia) to 7.5% and 5.8% of GDP, respectively. This study adds to the literature by presenting actual costs and effects of a health systems strengthening approach that addressed the 3 key barriers to receiving MNH care. We find that the approach costs about $177 to $206 per year of life gained, depending on the context. Ministries of Health and donor agencies have already demonstrated a willingness to pay this amount per year of life gained; for example, first-line antiretroviral therapy cost over $200 per person per year across 5 countries (including Zambia) in sub-Saharan Africa in 2010.50 Thus, we conclude that the SMGL approach as demonstrated likely represents a very cost-effective health investment. Thousands of individuals participated in activities to implement the Saving Mothers, Giving Life (SMGL) initiative. We would like to thank the many respondents that provided data for this study, including staff at health facilities, health offices and ministries, and implementing partners. This work would not have been possible without their gracious cooperation. Frank Kaharuza at USAID/Uganda also provided valuable insight into the SMGL program. Agnes Gatome-Munyua, Kelley Ambrose, and Christopher Cintron of Abt Associates contributed to the development of the data collection tools and data analyses. Christine Muhumuza and Agnes Nyabigambo helped to review the cost data from Uganda. Funding: Saving Mothers, Giving Life implementation was primarily funded by the Office of the Global AIDS Coordinator, USAID, Washington, DC; US Centers for Disease Control and Prevention, Atlanta, Georgia (Cooperative agreements GPS003057 and GPS002918); Merck for Mothers; and Every Mother Counts. This study was funded by USAID through the Health Finance and Governance Project (Cooperative Agreement No: AID-OAA-A-12-00080). The funding agencies had no influence or control over the content of this article. Disclaimer: The authors' views expressed in this publication do not necessarily reflect the views of the United States Government. Lifetime risk of maternal death. World Bank Open Data website. https://data.worldbank.org/indicator/SH.MMR.RISK. Accessed September 15, 2018.
. Reproductive, maternal, newborn, and child health. In: Disease Control Priorities. 3rd ed. Vol. 2. Washington, DC: World Bank; 2016.
. Interventions to reduce maternal and newborn morbidity and mortality. In: Black RE, Laxminarayan R, Temmerman M, Walker N, eds. Reproductive, Maternal, Newborn, and Child Health. Vol 2. Washington, DC: World Bank; 2016:115–136.
. Saving Brains: literature review of reproductive, neonatal, child and maternal health and nutrition interventions to mitigate basic risk factors to promote child development. GCC Working Paper Series, GCC 14-08. http://repository.upenn.edu/gcc_economic_returns/17/. Accessed February 19, 2019. Saving Mothers, Giving Life Phase 1 in Uganda: cost effectiveness analysis. USAID/Uganda Monitoring, Evaluation and Learning Program. 2016. Central Statistical Office (CSO), Ministry of Health (MOH), Tropical Diseases Research Centre (TDRC), University of Zambia, Macro International Inc. Zambia Demographic and Health Survey 2007. Calverton, Maryland, USA: CSO and Macro International Inc.; 2009. Central Statistical Office (CSO) [Zambia], Ministry of Health (MOH) [Zambia], ICF International. Zambia Demographic and Health Survey 2013–14. Rockville, Maryland, USA: Central Statistical Office, Ministry of Health, and ICF International; 2014. Uganda Bureau of Statistics (UBOS), ICF International Inc. Uganda Demographic and Health Survey 2011. Kampala, Uganda and Calverton, Maryland: UBOS and ICF International Inc.; 2012. Uganda Bureau of Statistics (UBOS), ICF International. Uganda Demographic and Health Survey 2016: Key Indicators Report. Kampala, Uganda, and Rockville, Maryland: UBOS and ICF; 2017.
. External evaluation of saving mothers, giving life: final report. New York, NY: Columbia University Mailman School of Public Health; 2013. Pregnancy Outcome Monitoring Survey, Uganda and Zambia Facility Outcomes. Unpublished data, 2018.
. Evaluations of large-scale health programs. In: Merson MH, Black RE, Mills AJ, eds. Global Health: Diseases, Programs, Systems, and Policies. 3rd ed. Burlington, MA: Jones & Bartlett Learning; 2012:815–852. Futures Group. Expenditure Analysis for Saving Mothers, Giving Life (SMGL) in Uganda. Washington, DC: Futures Group, Health Policy Project; 2013. Futures Group. Expenditure Analysis for Saving Mothers, Giving Life (SMGL) in Zambia. Washington, DC: Futures Group, Health Policy Project; 2013.
. Part one: methods for generalized cost-effectiveness analysis. In: Tan-Torres Edejer T, Baltussen R, Adam T, et al., eds. WHO Guide to Cost-Effectiveness Analysis. Geneva, Switzerland: World Health Organization; 2003:1–122. Bank of Uganda. Annual Report. Kampala, Uganda: Bank of Uganda; 2017. Bank of Zambia. 2018. http://www.boz.zm/. Accessed May 29, 2018.
International Monetary Fund. World Economic Outlook Database, October 2017. https://www.imf.org/external/pubs/ft/weo/2017/02/weodata/index.aspx. Accessed January 2, 2018.
. Costs of Healthy Baby Voucher Program Services. Bethesda, MD: Strengthening Health Outcomes through the Private Sector Project, Abt Associates Inc.; 2015.
WHO, UNICEF, UNFPA, World Bank Group, United Nations Population Division. Trends in Maternal Mortality: 1990 to 2015. Geneva: World Health Organization; 2015. UN Inter-agency Group for Child Mortality Estimation. Child mortality estimates: neonatal mortality rate (NMR) and number of neonatal deaths. 2018. http://www.childmortality.org/. Accessed December 14, 2018. World Health Organization. Global Health Observatory data repository life tables by country. Zambia. 2018. http://apps.who.int/gho/data/?theme=main&vid=61850. Accessed May 30, 2018. World Health Organization. Global Health Observatory data repository life tables by country. Uganda. 2018. http://apps.who.int/gho/data/view.main.61730?lang=en. Accessed May 30, 2018.
. Adding It Up: Investing in Contraception and Maternal and Newborn Health, 2017—Estimation Methodology. New York: Guttmacher Institute; 2018.